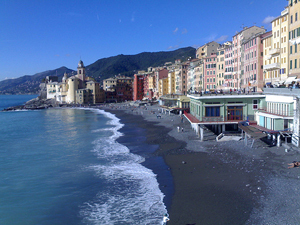 Camogli (Camoggi in Ligurian dialect) is a romantic and lovely Ligurian town located in the province of Genoa. It is also called La Città dei Mille Bianchi Velieri (the City of Thousand White Sailing Ships) or La Gemma del Golfo Paradiso (Gulf Paradiso’s Gem). Situated between the mountains and the sea, history and monuments, culture and fun, Camogli can offer you wonderful itineraries, and unforgettable landscapes and sceneries. It seems a typical small fishing village with an ancient and small harbour but it is also a remarkable sea resort renowned for its harbour and the multicoloured buildings on the waterfront. The most peculiar feature of the town is the presence of such colourful buildings overlooking the beach. The colours and the light horizontal lines (called marcapiano) were useful to sailors once they came back after fishing for recognizing their houses more easily among the several floors of the buildings. In Camogli you can marvel at the Castle of Dragonara, which dates back to the 12th century; here the inhabitants of Camogli used to gather to elect their representatives or hid inside the walls in dangerous situations. It was attacked and destroyed by Gian Galeazzo Visconti and Nicolò Fieschi in 1366, and after been rebuilt, also by the Duchy of Milan in 1438. During 16th century finally, it became a prison. The town offers tourists also the opportunity to visit two different museums: the Museo Marinaro “Gio Bono Ferrari”, which hosts a collection of nautical objects from Napoleon Bonaparte period to the First World War, such as sailing ships models, nautical instruments, ancient prints and paintings, original manuscripts, and also letters and objects which belonged to the famous Giuseppe Garibaldi. In addition, tourists will have also the chance to visit the Museo Civico Archeologico, built in 1981 and placed in a hall adjacent to the Museo Marinaro, it collects find of the ancient prehistoric Camogli castle which dates back to the Iron Age. We remind you that Camogli is linked with the Ancient Harbour of Genoa, San Fruttuoso, Portofino and other municipalities of the Gulf of Paradiso and of Cinque Terre by a ferries service which start several times a day.